Most of the nutrient recommendations for North Dakota crops were revised this year. For these crops and for minor crops that do not have a specific nutrient circular, this publication summarizes 27 crops or crop categories. 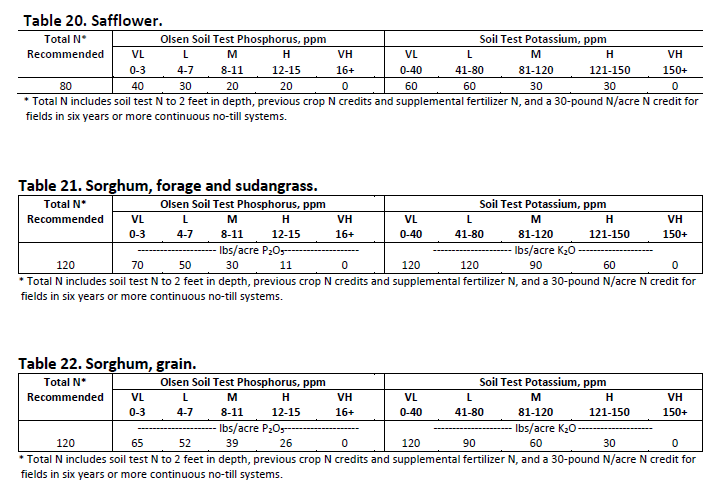 The following soil test recommendation tables are based on field research data obtained in North Dakota, South Dakota, western Minnesota and the Canadian Prairie Provinces. In the case of some crops, data in the literature also were used to supplement data available from this area. This publication contains major changes from previous publications. Please dispose of older editions. Changes to tables were based on new or re-evaluated data. This publication contains several major changes from previous versions, including revised potassium recommendations for alfalfa, corn and sugar beet, and the elimination of yield-based nutrient recommendation formulas. Fertilizer needs should be determined after evaluating the current fertility level of the soil through soil testing, preferably using a site-specific zone sampling approach, as well as the nutrient needs of the crop to be grown, and knowing the historic productivity of the soil. The most important reason for abandoning yield goal as a consideration in fertility recommendations is that the data from modern fertilizer rate trials indicate that a similar rate of nutrient results in the highest yield regardless of the maximum yield in any experiment. In other words, the rate of nutrient resulting in the highest yield in a low-yield environment was similar to the rate that resulted in the highest yield in a high-yield environment. A logical way to explain this is that in a low-yield environment resulting from too wet or too dry conditions, nutrient use efficiency is quite low, so a greater rate of nutrient is required to produce a unit of yield. In a high-yield environment, nutrient use efficiency is quite high because release from the soil is maximized, root growth is maximized and the movement of nutrient to the root is maximized, so a lower rate of nutrient is required to produce a unit of yield. Therefore, the recommended N-rate table values should be utilized regardless of what yield a grower believes will result from the barley cultivation. Several of our N recommendations are “capped” at a maximum rate. In years that support higher yields, our data indicate that greater N release from the soil and greater ability of crops to capture available soil N will support these higher yields without requiring supplemental N fertilizer greater than capped rates. In addition, sunflower N recommendations are capped due to greater lodging risk as the N rate increases. Nitrogen (N) recommendations for most crops except some legumes are based on the amount of nitrate N (NO3-N) in the top 2 feet of soil and the yield potential. Omission of the 2-foot nitrate-N analysis results in random numbers for the N recommendation. The 2-foot nitrate-N soil test is extremely important in this region for optimal N recommendations and to promote N-use efficiency, greater farm profitability and environmental stewardship. 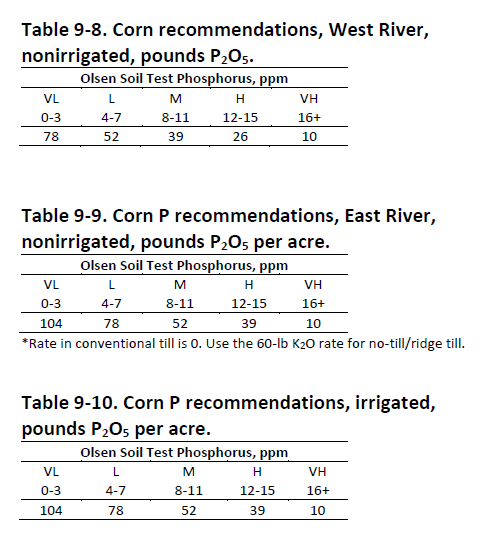 Nitrogen fertilizer recommendations are not adjusted based on method of placement, but they are adjusted for previous crop and depth of sampling. To determine the amount of recommended fertilizer N, subtract the amount of soil NO3 N as determined by soil test and N-credit from the previous crop, if applicable, from the total amount of available N needed for a particular yield goal and crop. Spring wheat, durum, corn and sunflower N recommendations include economic modifiers to rate based on an economic production function that combines yield/quality increases/decreases with nutrient rate and the cost of nutrient input to indicate the N rate that will provide the grower with the greatest net economic return. The soil test indicates that 55 pounds of NO3 N are present in the soil to 2 feet. The chart in Table 6 indicates a recommendation of 150 pounds of N per acre total requirement. The amount of N to apply would be 150-55 = 95 lb N/acre. Some crop residues have a lower carbon-to-nitrogen (C/N) ratio than others, which results in a release of plant-available N through rapid decomposition. Also, the mass of residue of some crops is less than others (dry bean compared with wheat or corn, for example). Evidence also indicates that some crops (soybeans, other annual legumes) may accelerate the normal N mineralization rate from organic matter during their growing season, extending to the early growing season of the next crop. Nitrogen availability is greater following crops with a lower C/N ratio (sugar beet, alfalfa) and crops having a lower mass of residue (soybean, dry bean) with less ability to tie up N during decomposition. The following N credits should be subtracted from crop N recommendations based on comparative subsequent crop N rate response. The values in the Credits table come from North Dakota and Minnesota experiments. The original data for calibration of the NO3-N test (1950s) was based on soil samples taken to a depth of 5 feet. Sampling beyond 2 feet improved nitrogen recommendations somewhat, but in the late 1960s, researchers decided that the extra effort to sample to a depth of 3 or 4 feet was not practical or necessary for most crops. Drought and application of excess N, however, may result in a buildup of available N below 2 feet. When fields are tested for N each year and only the recommended amount of N is applied, an accumulation of nitrogen below 2 feet is unlikely unless N is not utilized by the crop due to drought or is leached in medium and coarser soils due to excessive early growing season rainfall. Sugar beet is the most likely crop to be sampled to the 4-foot depth, but adjustments are not necessary in N calculations. 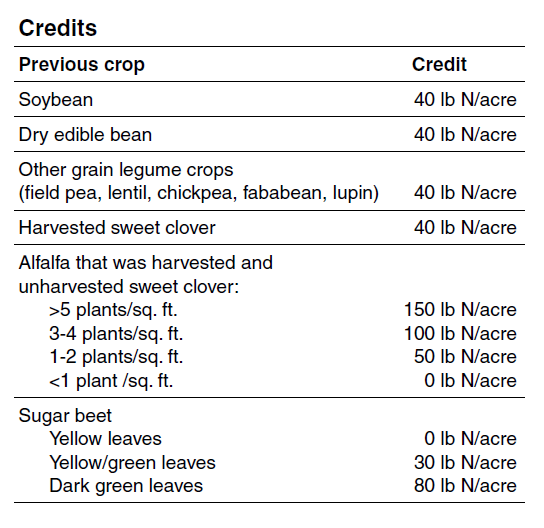 Sugar beet N recommendations for 2- and 4-foot samplings are provided in Table 24. • If the amount of NO3 N in the 2- to 4-foot depth is less than 30 pounds of NO3 N/acre, do not adjust the N recommendation. • If the amount of NO3 N in the 2- to 4-foot depth is more than 30 pounds of NO3 N/acre, reduce the N recommendation by 80 percent of the amount greater than 30 pounds/A. For example, if 50 pounds of NO3 N/acre are present at the 2- to 4-foot depth, reduce the N recommendation by 16 pounds of N/acre (80 percent X (50 pounds of N/acre less 30 pounds of N/acre, or 20 pounds)) = 16. 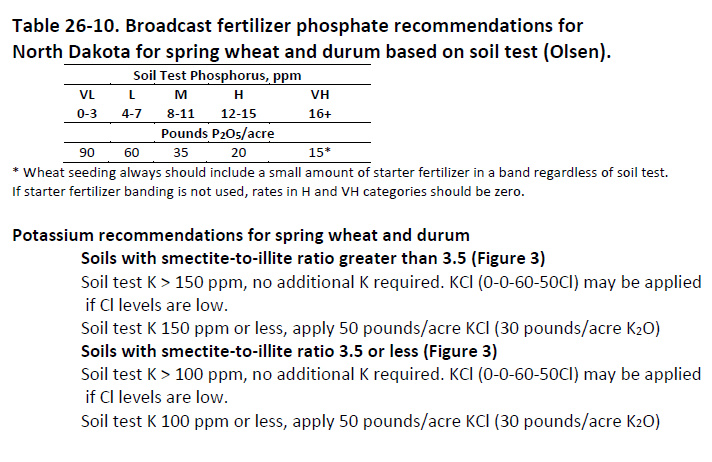 The rate of phosphorus (P) and potassium (K) recommended in these tables is the amount to be applied as a broadcast application. Because banded fertilizer generally is used more efficiently in the year of application, the amount of P2O5 and K2O in the tables can be reduced by one-third when banding and the result will be similar to the yield with the full broadcast fertilizer rate. Data from field trials in drier or cooler years indicate that small grains, corn and canola will respond to seed-placed or side-banded P fertilizer, even on soils testing medium to high in phosphorus. 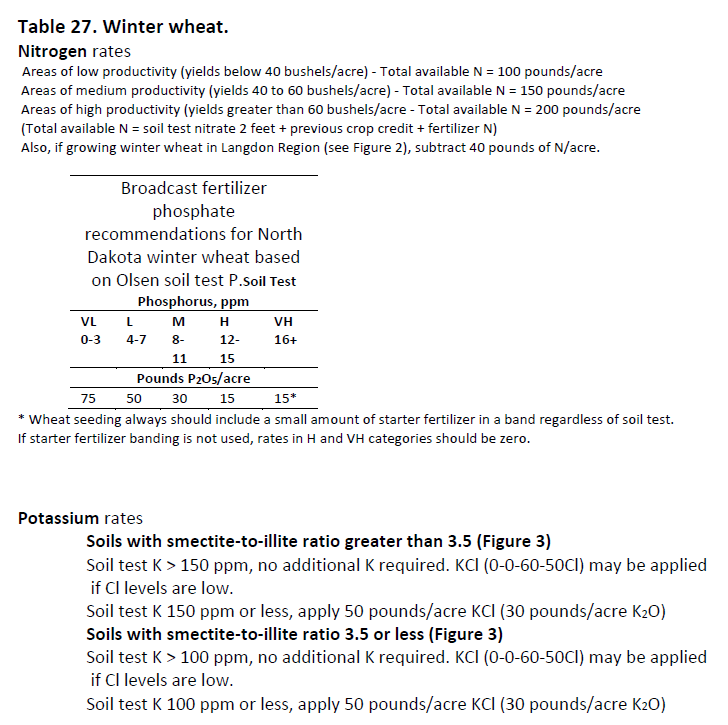 Broadcast recommendations of P and K for low- and very low-testing soils may include buildup P and K rates. When rates are reduced, soil test levels are not increased through time. 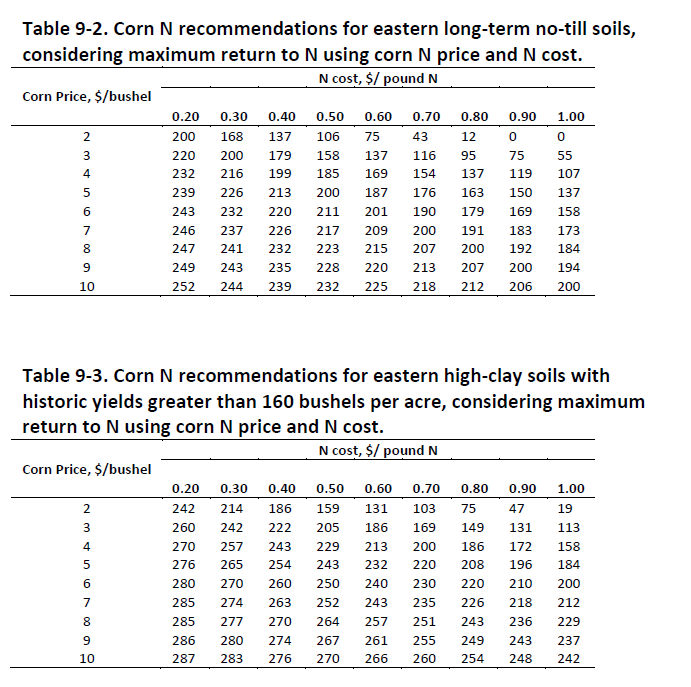 Corn recommendations include K tables related to clay chemistry and K application economics. Sulfur (S) deficiency most likely will occur on sandy soils throughout North Dakota and on well drained, medium textured soils. However, in wet seasons, S deficiency has been recorded on clay soils with organic matter content greater than 5 percent. Sulfur deficiencies appear most often on higher landscape positions with a thin-surface organic-matter layer (“A” horizon) and coarse soil texture (loam to sand and gravel), but having S deficiency is possible on almost any nonsaline soil should the seasons be wet. Our current S soil test characterizes the S status of the soil very poorly. The test commonly underestimates or overestimates the available S in soil for a variety of reasons. Noting the texture, organic matter content, landscape position and rainfall in the past year is almost always a better predictor of S need than soil testing. In a year following a high rainfall/snowfall year, applying 10 to 20 pounds of S/acre regardless of landscape position, soil texture or organic matter may be prudent. Since 2014, serious S deficiency has appeared in many fields that we previously believed would provide adequate S. The sulfur source should be sulfate- or thiosulfate-based and not elemental S of any kind. The chloride (Cl) soil test is calibrated only for small grains, although a few responses also have been seen in corn within the U.S. In general, responses to Cl in small grains have been in the range of 1 to 6 bushels per acre on responsive sites. The economics of Cl use is most favorable in barley because small-grain yield increase to Cl is due to increased kernel size. Increased kernel size in barley is the market-criteria “plump,” which is a metric used to determine barley suitability to malters. The greater the plump score, the more likely the grain can be marketed as malting grade. The Cl recommendation is determined by subtracting the amount of Cl found in the top 2 feet of soil from the critical value of 40 pounds/acre, although most of the yield response is the result of the first 10 to 15 pounds/acre of Cl applied. The most commercially available and cheapest source of Cl fertilizer is 0 0 60 (potassium chloride, muriate of potash), which contains approximately 50 percent Cl. The DTPA (diethylenetriaminepentaacetic acid) soil test analysis is used in North Dakota to analyze soils for plant-available zinc (Zn), iron (Fe), manganese (Mn) and copper (Cu). Calibration data in North Dakota are available only for Zn on crops known to respond positively to Zn application in the state: corn, potato, flax and dry edible bean (not soybean). Calibration data also are available for Cu on wheat/durum and barley. Micronutrient requirements are crop-specific. Additional crops would not be expected to respond to Zn or Cu if not listed above. The Cu soil test has been useful only in the state if the soils are less than 2.5 percent organic matter in deep sandy soils, such as an eroded Arvilla loamy sand found in Red River Valley beach soils and in numerous sandy glacial outwash-derived soils in eastern North Dakota. When corn, potato, flax or dry edible beans are to be grown on a field testing low to very low in Zn, the recommendation is to apply 10 pounds/acre of Zn as zinc sulfate in a broadcast application, or one-third of that rate in a seed-placed or near-seed band. Zinc is especially required in these crops if high levels of broadcast P or a starter P fertilizer is applied when soil Zn levels are low. The water solubility of the Zn fertilizer is important in efficient dispersion and uptake. Also, the crop is more likely to achieve a first-year response to zinc sulfate if the fine granular formulation of the product is used instead of the MAP (mono-ammonium phosphate)- or DAP (diammonium phosphate)-sized granules usually available. A fine granular application should be made using a fine-granular applicator similar to those used in the past to apply granular herbicide formulations. The distribution of large granules may not be adequate to supply all plants with Zn if low rates are applied. A broadcast application of zinc sulfate should correct a Zn deficiency for four to five years. Zinc chelates at suggested manufacturer rates also may be used but are relatively expensive per pound of plant food and offer no residual soil buildup. Banded chelates at 1 pint to 2 quarts/acre can be applied near or with the seed at planting. Foliar applications of zinc chelate and other soluble Zn fertilizers at low rates also are effective for correction of deficiencies for a single season. No Zn is recommended on fields testing medium or above or on fields testing very low, low or medium if the crop to be grown is not a Zn-sensitive crop. Ammoniated Zn complexes also are effective Zn fertilizer sources. In general, the supply of soluble iron (Fe) to plants from soil is related to the soil carbonate level, which is important to determine if the field will be in soybean when the soil pH exceeds 7. If carbonates are present, soil wetness, cold soils, excessive tillage and high soluble salt levels influence the presence and severity of iron deficiency chlorosis (IDC). Most North Dakota crops are not sensitive to low available iron and are adapted to regional conditions. However, IDC has been seen in flax, field pea and dry bean and is a particularly serious problem in soybean. Seed treatment with ortho-ortho-FeEDDHA (iron-ethylenediaminedi (o-hydroxyphenylacetic) acid) has provided the most consistent soybean yield increases in IDC-susceptible soils. It should be seed-placed in a band as directed on the label for greatest effectiveness. Other Fe fertilizers, including ortho-para-FeEDDHA, are far less effective. Yield increases to ortho-ortho-FeEDDHA also have been seen in sugar beet in the absence of IDC in multiple trials. Foliar applications have not been effective in correcting IDC and achieving similar yield to a seed-placed o-o-FeEDDHA band. The best solution on fields with IDC is to plant varieties with greater regional IDC tolerance (not Iowa IDC ratings), and avoiding soybean cultivation on soils with high IDC potential and high in soluble salts. Researchers at NDSU have rated about 200 soybean varieties each year for the past 10 years for IDC tolerance. No field responses to manganese in North Dakota have been documented. Therefore, a recommendation is not made for any soil test level. Yield increases due to soil-applied Cu were documented in North Dakota; however, the responses were on low-organic-matter, loamy sand soils with low (less than 0.3 parts per million) Cu levels. A number of companion trials on similar soils resulted in no yield increase. At best, copper should be applied only to low organic matter, sandy soils with low soil test levels, but expect a success rate of about 15 percent positive yield responses in small grains. Copper fertilizers are expensive, and their use should be based on weighing the productivity of responsive soils with the low return of benefits if copper were applied. The following tables can be used for the yield potentials shown. For other yield potentials, use the equations at the bottom of each table. Figure 1. General climatic delineation between cooler and moister areas in North Dakota compared with warmer and drier areas. In a given year, the line separating the two regions may move considerably east or west. For use with Tables 1, 4-2 and 6. (Image courtesy of NASA, Angela King – image compiler, and Hobart King/Geology.com, publisher). Figure 2. Agri-climatology regions for use in Tables 25-1 through 25-3 for sunflower and Tables 26-1 through 26-9 for spring wheat and durum N recommendations, and Table 27 for winter wheat considerations. Figures 2-2 and 2-3 for Alfalfa; 9-11 to 9-14 for corn, Table 18.4 for potato, Table 24 for sugar beet and for spring wheat after Table 26-9 and winter wheat after Table 27.